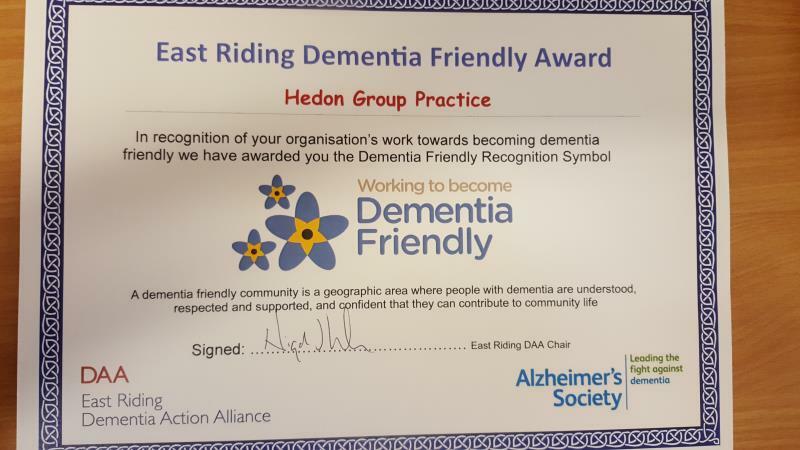 The Hedon Group Practice was awarded a Dementia Friendly Award in recognition of working to become dementia friendly from Graham Stuart MP. The practice joined other businesses in this award ceremony organised by Dementia Action Alliance. Worried about your memory? The practice offers a memory screening service. Please see or call reception to book now. The Dementia Action Alliance is a movement for social change made up of organisations from the public, private and charitable sectors committed to transforming the quality of life for people living with dementia in the UK and the millions who care for them. For more information, click here. Activity groups give people affected by dementia the opportunity to take part in structured activities. Run by a facilitator, who encourages and supports people to take part, the groups are also a chance to relax and socialise. The Hedon Group Practice is proud to be part of the Dementia Action Alliance team. The Dementia Action Alliance is a movement for social change made up of organisations from the public, private and charitable sectors committed to transforming the quality of life for people living with dementia in the UK and the millions who care for them. If you are interested in finding out more about the Dementia Action Alliance please visit www.dementiaaction.org.uk or contact Emma Williams 01482 211 255 or emma.williams@alzheimers.org.uk. If you would like to read about the practice profile and action plan, please click here.